Here's a story from last fall that didn't get reported on the Racer Rowing Society blog. Shame on us for not getting a good story into print sooner! For alumni, friends and family who are outside the information loop: this one's for you. 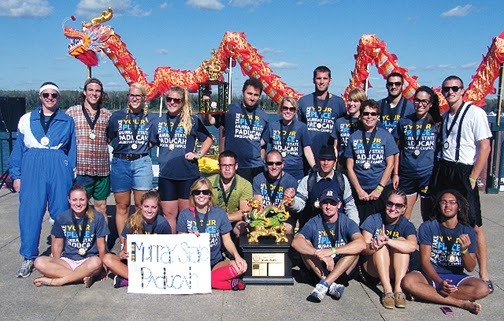 In 2012, Racer Rowing participated in Paduca's first ever Dragon Boat race. 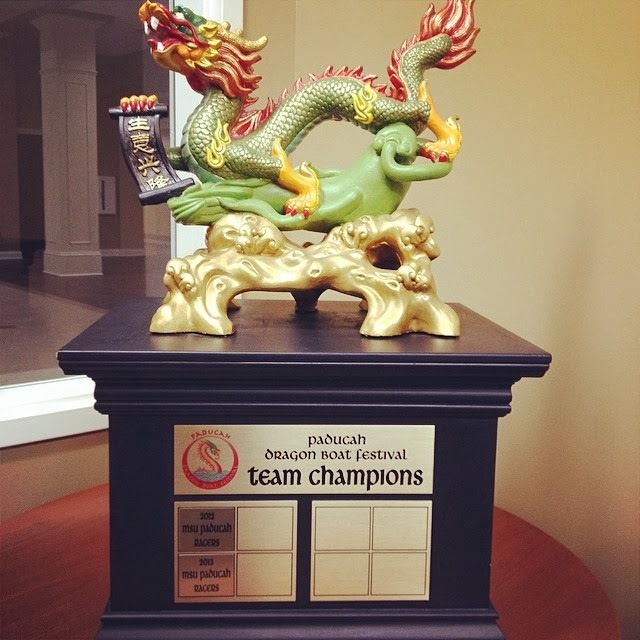 Facing off against other boats in 250m sprints, the MSU Paducha Racers paddled their way to secure the team champions trophy. There were several more teams there this time and they were out to get us. Everyone knew we were the defending champions....It is so much fun to be up there, though, to be part of the atmosphere. It's a well-done event and it's a neat way to spotlight their riverfront....Plus, it was a great way for us to promote the name of Murray State. With respect to the team's repeat victory, Lavit said, "We had to earn this one. There were a lot of good teams up there. Plus toward the middle of the day, they trimmed our team numbers from 20 to 16 (per boat) because of wind, so that took a little adjusting too." Proceeds from the event benefited Paducha's River Discovery Center. Congratulations, Racer Rowing! Way to kick off two consecutive fall seasons with a strong showing at this event! Do you have a story to share about Racer Rowing? Do you have any pictures of Racer Rowing in action? Please share with The Racer Rowing Society. Contact the site moderators here.